We offer "in-surgery" tooth whitening to change the colour of your teeth by up to 8 shades. The shade of your teeth and photos are taken before your treatment in preparation. After the procedure is complete, you will be shown the change to your teeth. This treatment is instant, so if you are wanting instant whitening, and are limited for time, for example you are attending a wedding of a function, this treatment is ideal. The Dentist or the Dental Hygienist can whiten your teeth in surgery. The procedure takes around 15-30 minutes to prepare the patient for the treatment. After that up to four subsequent 15 minutes sessions are completed. The overall time is likely to be approximately 1.5 hours. Some patients bring earphones so they can listen to their music devices. Occasionally this can happen, but changes to the formula have helped to reduce this. That depends on your lifestyle. The whitening will last longer if you avoid foods and drinks which stain your teeth, for example, red wine, black tea and coffee, currys. Good oral hygiene will help maintain your white smile. Can I top-up the whitening at home? Yes, we can provide you with take home trays and bleach, if you would like to maintain or lighten the colour of your teeth. Philips Zoom in-surgery whitening treatments are not intended to lighten artificial teeth, caps, crowns, veneers or porcelain, composite or other restorative materials and that people with darkly stained yellow or yellow-brown teeth frequently achieve better results than people with gray or bluish-gray teeth. Teeth with multiple colourations, bands, splotches or spots due to tetracycline use or fluorosis do not whiten as well, may need multiple treatments or may not whiten at all. Your Dentist or Hygienist will be happy to answer any questions that you may have. 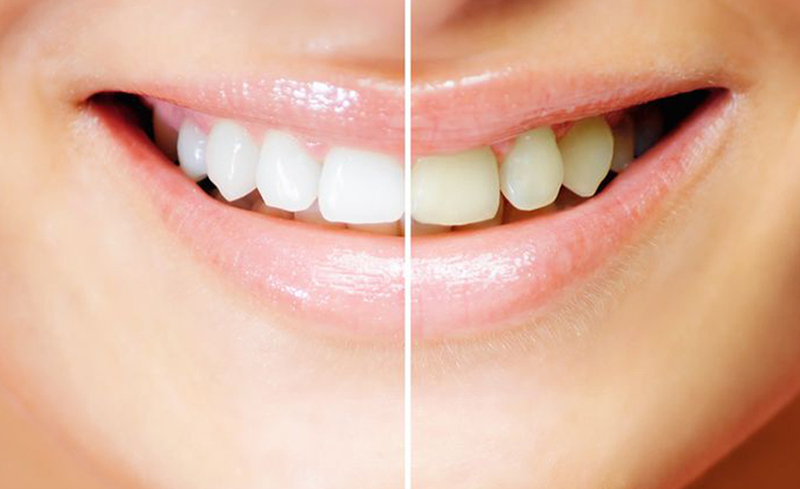 Teeth whitening can’t make your teeth brilliant white, but it can lighten the existing colour by several shades. Teeth whitening won’t work on dentures, crowns, fillings or veneers. If you’re concerned that teeth whitening by a dental professional has harmed you, contact the Dental Complaints Service on 0208 253 0800. This is an expert, free and independent service that can help if you have a complaint about private dental care.